Solution : Bite out of the "o" and warm buttery color scheme simply tells the biscuit/restaurant story, in a modern but soft way. Client : Online program that connects students who want to explore job shadowing with companies in their field of interest during the gap year before entering college. Requirements : Modern, Relevant, Clean, Appeals to students as well as parents and companies. Solution : Clean line modern font and graphic that combines the image of compass and paper plane. Client : Event company headed by Ellen Hockley that specializes in events for non-profits. Requirements : Logo should be elegant, modern and versatile to denote quality in product and variety of events serviced. Solution : Logotype serves as monogram for company initials for use as a separate component as well as a combined logo with the full business name that uses a mmodern elegant interlocking typeface. See greater-goodevents.com for more info. Client : Family run winery out of Arizona. Requirements : Logo needs to include an illustration of the family horse Rosie, and the initials CHV in a calligraphy style one of the owner's created. The clients likes modern but not stark styles and metallics. Logo will go on black label. Solution : I wanted to render the horse image in a gestural style with a water based medium to tie it together with the initial calligraphy so I commissioned this illustration from a watercolorist friend Jess Bonin and played with adding different textures with different horse shapes till I found this lockup. With the type I wanted to go classic and simple, to balance the complexity and chaos of the logomark. Requirements : Create logos that fit the given development names while feeling universal and high end and contemporary targeting upper middle class families. Solution : Modern and clean line logotype with graphics that convey the invoked imagery in a somple interesting way that will be easily tranferred across platforms. Client : Furniture company specializing in tables made with live edges from large urban trees. Requirements : Logo needs to be simple and convey the point, while feeling high end. The client wants nothing fancy and something he can brand on the tables. Solution : Simple sans serif type and black and white palette with the "t" in the initials illustrating a tree in a minimal style. The initials can stand alone for branding. Client : Small independent bakery in the Ravenna neighborhood of Seattle with young owners that like clean contemporary design with a rustic edge. Requirements : Nod to the grass topped homes of the namesake with hand-drawn type and contemporary whimsy that speaks to their aesthetic. Solution : Stamp textured illustration that minimally conveys the image with hand-drawn font that feels turn of the century while also now . See sodhousebakery.com for more info. Client : Justin Taft, owner of both the Hangar and Ridgeback Cafe, both breakfast/lunch restaurants specailizing in crepes, waffles, sandwiches and salads. Both are eclectic, cozy, diner-esque but not dated, casual, comfortable and characterized by mismatched funky salt and pepper shakers. The Ridgeback is more modern while the hangar more homestyle. Requirements : Must match in some way but have their own identity in another, and be appealing for use in merchandise sales. Hangar must include plane, the Ridgeback silverware. The Ridgeback added a Market to the store post redesign so that needed to be added to the logo. Solution : Font that feels laid-back and welcoming yet stylish and slightly retro for diner feel. Both have a "g" with strong character that ties stores together. Predominant colors found in the cafes were incorporated into scheme. The "Market language was brought in with banner to emphasize newness and separate concept. Feels eclectic but streamlined to appeal to a wide age range, but predominately the main audience of 20 to 40 year old neighborhood urbanites. See also branding collateral, interactive design, packaging, painted sign art, chalk art, for more projects with this brand. 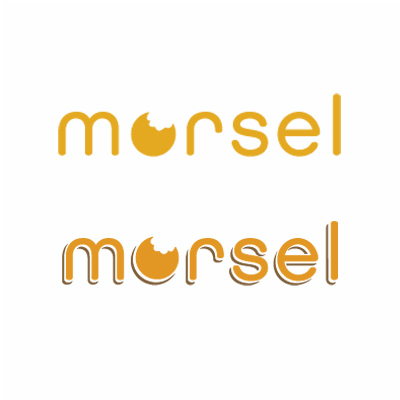 Client : Specialty coffee shop teamed with morsel, a biscuit shop in the university district. Solution : We kept things simple to convey modern and high end but kept casual with color and font. Requirements : retro but clean, nod to instruments instructed, includes colors but not childish. Solution : The color overlays keep the colors subdued and classy while alluding to the teaching philosophy. Lines hint at strings and fonts feel retro but relevant. See also branding collateral or more projects with this brand or www.pcmusicinstruction.com for company info. Client : Celeste Clark, fun loving roaster starting her own craft coffee shop in red 50's milk truck. Requirements : Include diver into coffee illustration, should feel fun but professional, on red background and vintage to coordinate with truck. Solution : Clean but fun illustration that suites red background and hand-drawn typography to match imitating splash, implying whimsical but classy. Requirements : Imples recycling, stylish, boutique, universal enough to work with every vendor. Solution : Uses tangible textures to tell the renewable story. Recycling icon implied subtly with ribbon font that feels crafty yet still clean. Client : Mobile app co.that makes games designed to help occupational therapists teach disabled children cognitive and motor functions. Requirements : Illustration of client's dog and game's main character Shelby, circular, kid friendly, clean. Solution : An illustration and type that appears “doodled” and fun for the kids, yet still simple and modern for Ipad aesthetics. Solution : Curly font is girly yet not over the top placed in a classic circular layout that lends itself to both a retro and current style. Type lock rounds out a clean pleasing pretty look with colors that balance neutral with pop, like a good outfit. Client : Seattle Mom blogger who writes about juggling work & home. Requirements : Needs to seem both girly & sophisticated. Whimsical yet simple. Must use pink. Client : Mobile app for people to record the state of their rental cars in order to avoid potential unwarranted damage charges. Requirements : modern and clean, embodies the message of the product simply and beautifully. Solution : A strong font choice conveys the message of the product and simplified shield over the car tells us more about the story in an emblematic way. Requirements : Incorporte the message of emergency, technology and outreach with Seattle specifically at a glance. Solution : The Space Needle is re-imagined as a transmitter, built into the word crisis, tying it all together. Client : A Nepalese orphanage and non-profit organization. Requirements : Include common themes from the orphan children's drawings of what the orphanage meant to them ; wings, houses, and hands. Solution : From these themes I came up with an image that I feel embodies the message of an orphange’s purpose : the hands embrace and support the house and it’s spirit, while also serving as the wings of improvement and lifted futures.